The kit contains 66 olive coloured parts spread over two sprues. 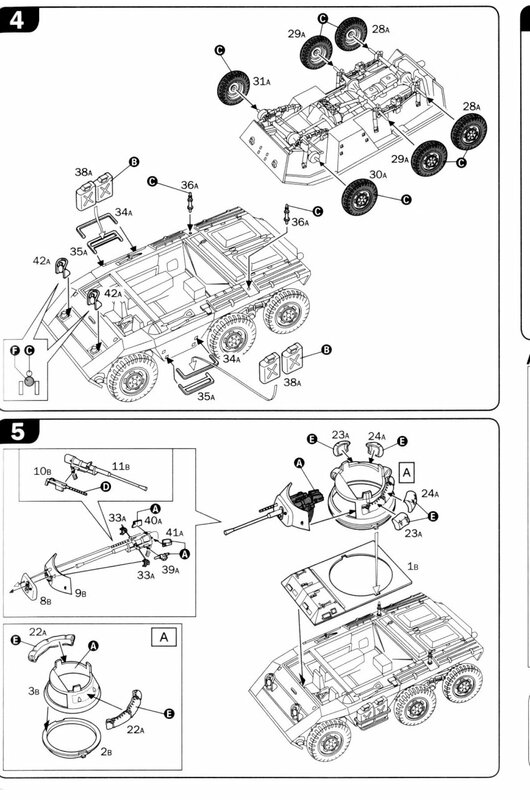 Instructions give the modeller two build options - one using all the parts for a full suspension, in a 6 step build sequence, the other with a very simplified suspension, in a 4 step build sequence. 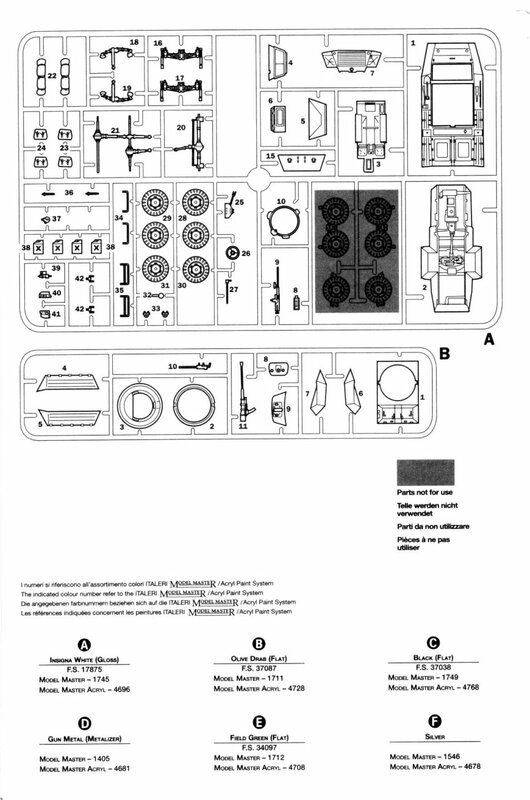 I assume the simplified build is intended for war gamers wishing to put together a quick kit that doesn't need a lot of detail and is a bit more durable for gaming. 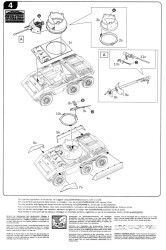 With the simplified suspension the modeller dispenses with the suspension and drive shaft parts and replaces the wheels with a set of simplified parts (11A, 12A, 13A and 14A) which are shown greyed out on the sprue diagram. Also included is a decal sheet and a 35 page Alzer Wargames booklet. 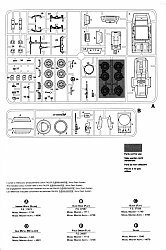 The parts are well molded with no flash and only minimal seam lines, while the plastic is nice and firm and responded well to liquid glue. The tools are molded to the hull which is unfortunate. 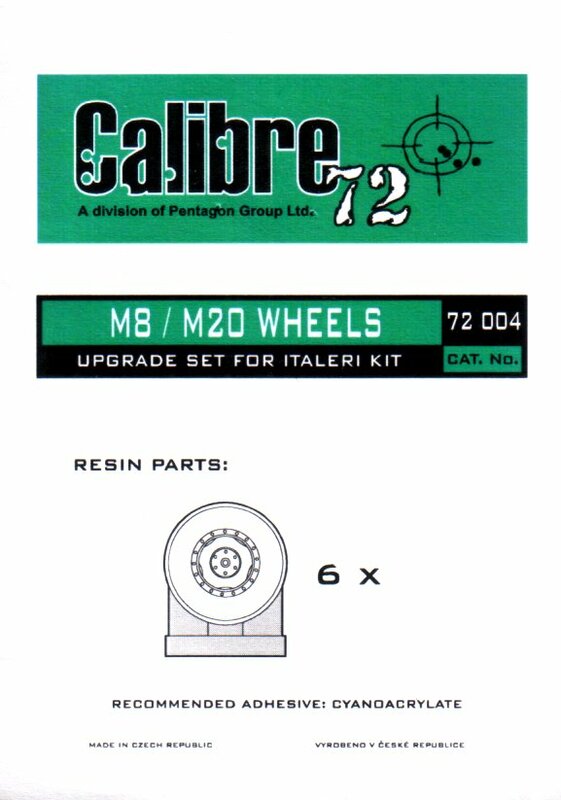 I would have preferred to have them as separate pieces as Italeri has done with their excellent AB-41 and AB-43 kits. The hull has a minimal interior consisting of a floor pan with seats, a steering wheel, an instrument panel plus side and rear bulkheads. 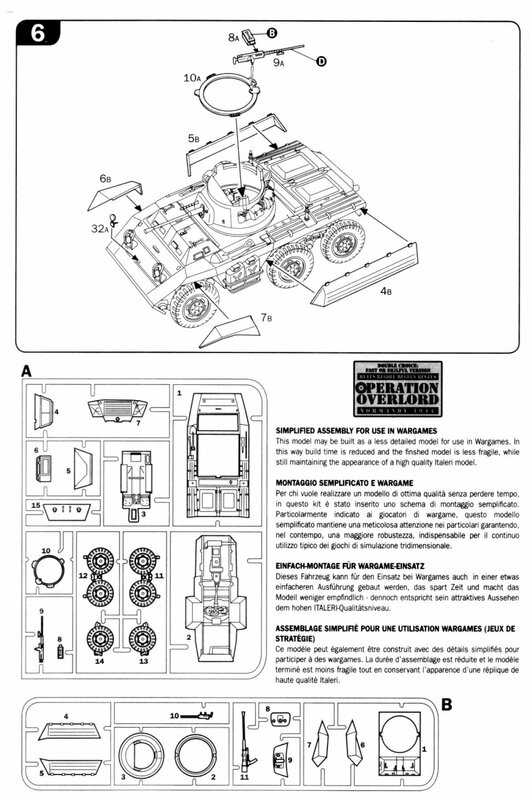 Unfortunately there are absolutely no interior parts for the turret. Construction was straight forward. 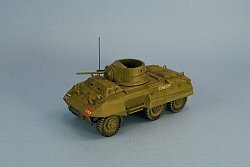 I built my M-8 in four sub-assemblies: wheels, hull, turret and gun mantlet. There were a few things to watch for. 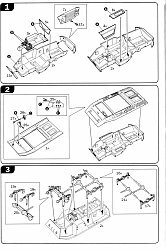 The front drive shaft is too short to reach the transfer case so a small piece of plastic rod is needed to bridge the gap. There are a pair of large boxes molded to each side of the interior floor. I found no pictures on the web that showed them so they were cut out of the floor and the large holes were filled with pieces of plastic sheet and then the seams were filled. 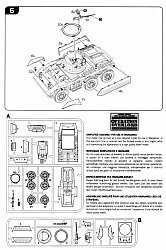 I had to cut off the two mounting tabs for the turret as they rubbed against the inside of the bulkheads and prevent the turret from sitting flush to the hull. Replaced the handles for the driver and gunner hatches on the hull with new ones bent from some thin wire. Added lift rings fashioned from some copper wire to the front glacis and rear panel. Drilled holes for the 37mm and MG barrels. I shaved off the molded on tow rings on the front and replaced with new mount made from plastic and new tow rings from some copper wire. 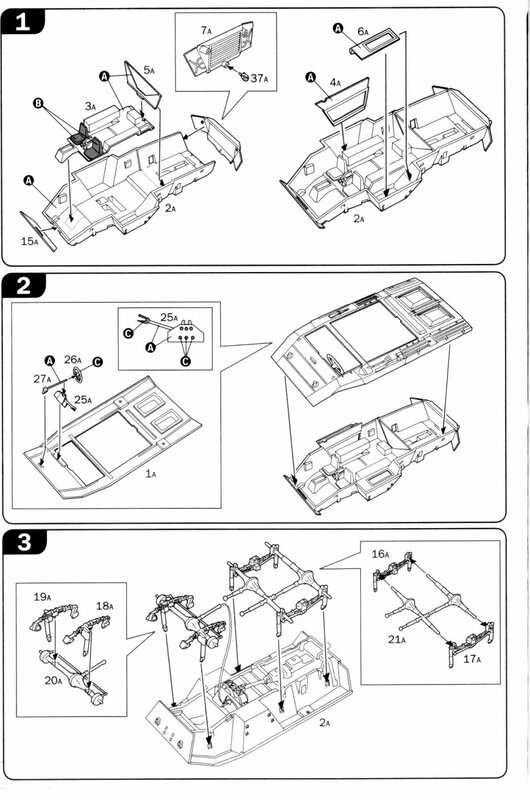 Added the missing tow mounts to rear panel. Added an exhaust pipe to right rear fender from a piece of plastic rod which I bent to match up with the molded on pipe running up the hull side under the rear fender and then drilled a hole into the end that juts through the rear fender. Scratch built the turret seats and frame. 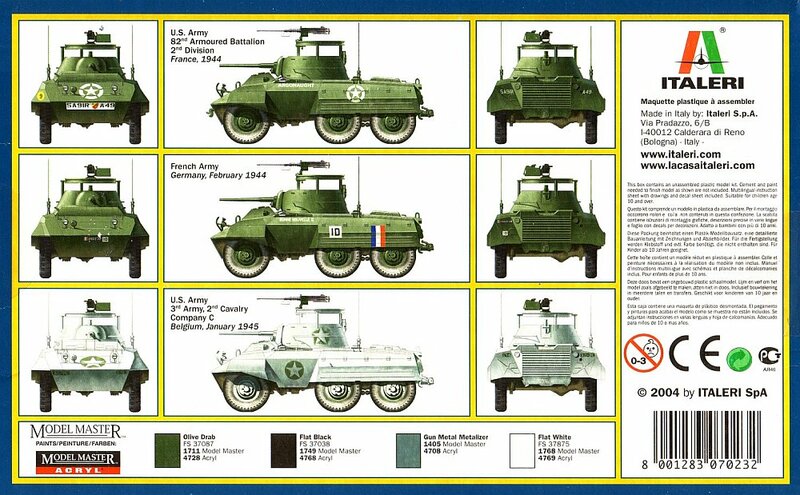 My reference was a quick diagram I made of the Tamiya 1/35 scale kit that another member in my local IPMS club happened to be building at the same time as I was doing my 1/72 scale kit. Added rests for front hatches used to hold up the hatches when they are open as found on the real Greyhound. Modified the braces for the brush shields by cutting off the solid braces and adding new braces cut from thin plastic strip. 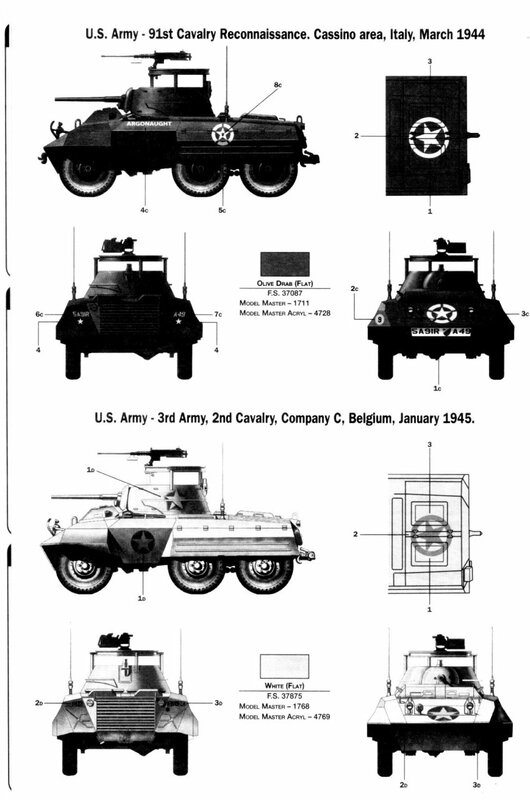 According to web references I found the actual tire width is 9 inches so the Calibre72 wheels are undersized but closer to scale than the Italeri versions. My guess is that the extra width of the Italeri wheels along with the slightly shorter height is probably what makes them appear stubby and fat. 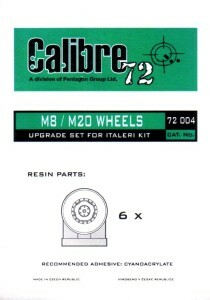 Overall the casting of the Calibre72 wheels was excellent. I found that the wheels were too close to the pour stubs which caused the tire tread to disappear once the stub was removed, and I also noticed a distinct flat spot in the wheel's circumference. 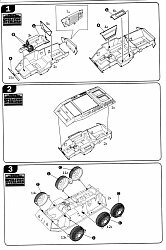 Even though I planned to hide each tire's flat spot by placing it behind the fenders I did repair the treads by carefully cutting and scraping the missing lugs into the tire. I also noticed that the tire thickness is wider at the pour stubs. While the rest of the wheel is 0.12in wide, at the stub it is 0.15in wide, giving the tires a slight bulge. 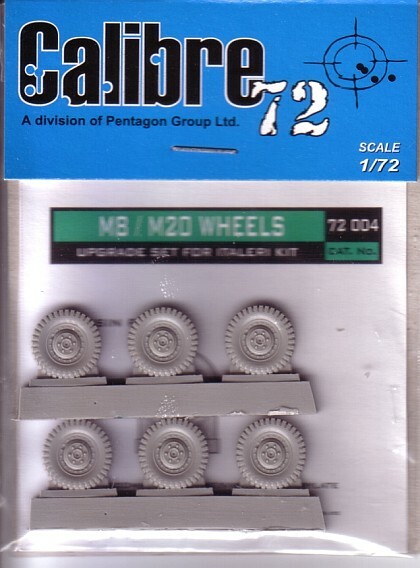 I'm not sure if this was done on purpose by Calibre72 to give the model sense of weight when mounted to the axles or just an accident caused by their casting process. There are no mounting holes on the rear of the wheels so these need to be drilled, but be very, very careful because the resin is quite thin here and if you drill too far you will go right through to the front side. This happened to me on two of the wheels which fortunately worked out well because Calibre72 has all six wheels with the same hub style but those that mount on the front axle should have an extended hub. Thus the two wheels that I drilled through were earmarked for the front axles, and adding the extended hub they needed also covered the unwanted hole. 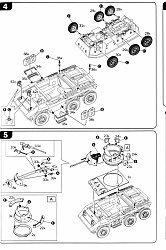 When it came time to add the wheels I found that I had to nip a small piece from the end of the rear axles to get the rear wheels to line up with the front wheels and to get them to sit at the proper distance from the suspension and inside of the fenders. 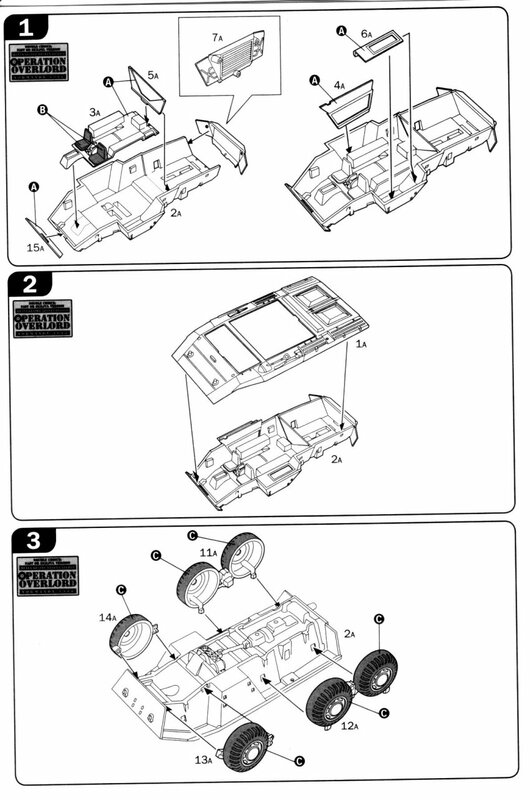 I also carried through with my original plan and placed the bulges and flat spots such that the fenders hid them. I did this for two reasons. 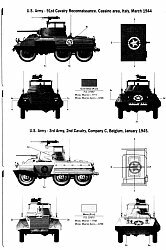 First I could not find any web pictures that showed an obvious bulge in the tires on any M-8s and I didn't feel like going through the exercise of getting the wheels to sit flat on these bulges. 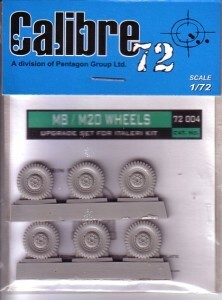 Once in place though, the Calibre72 wheel set really makes a difference in the look of the model. Shaving off the tools and adding a shovel strap from a scrap brass piece. 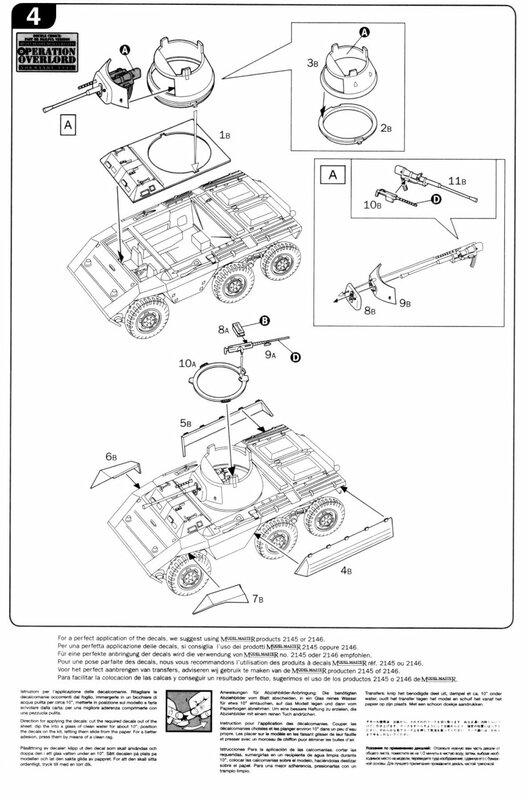 No other tools were added as per the reference photograph. 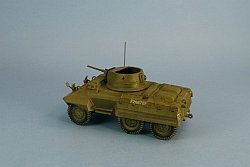 Because this M-8 served with a Canadian unit I needed to fill in the holes for fender antenna mounts used on American M-8s and add a new mount to the right side of the hull as would be expected with a Commonwealth unit. A piece of guitar wire was used for the antenna. 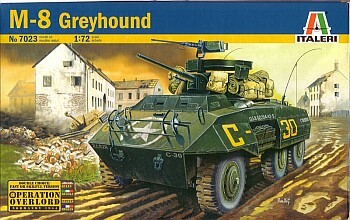 This particular Greyhound had the 50cal. MG gun and ring removed so these were cut from the turret and the mounting brackets sanded from the sides. No storage on the turret was present. I discarded the kit's bags and added the exposed stowage ring to turret's side. A mirror from the spares box was added to the front left fender. 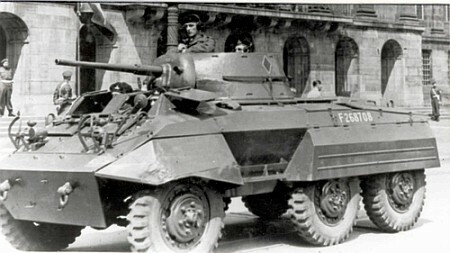 C-30 Colbert (U.S.A. 6033442-S) of the 82ndArmored Recon Battalion, 2ndArmored Division, France, 1944, in Olive Drab camouflage. 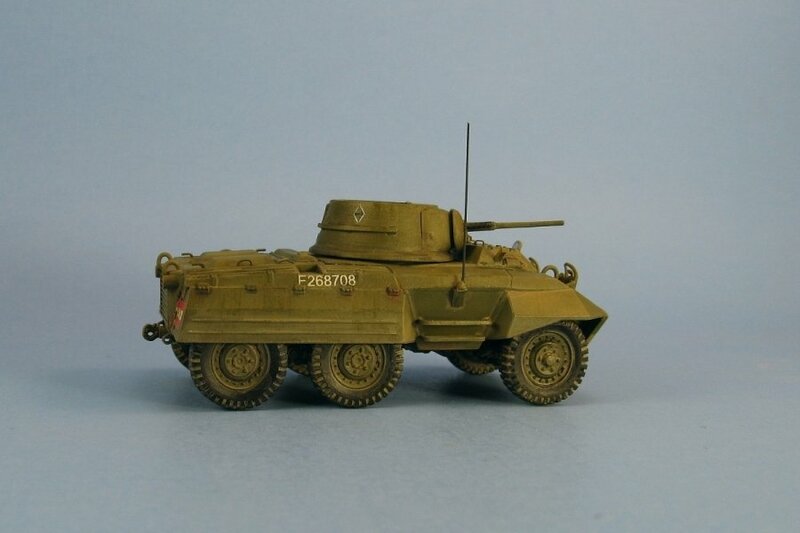 Bonne Nouvelle II, plate number 468170 , French Army, February, 1945 in Olive Drab camouflage. Argonaut, 91stCavalry Reconnaissance, Cassino, Italy, 1944 in Olive Drab camouflage. 3rd Army, 2ndCavalry, Company C, Belgium, January, 1945 in a plain winter camouflage with only stars for markings. Unfortunately I couldn't use them for my RCD Greyhound so my first step was to see what was available for aftermarket markings. 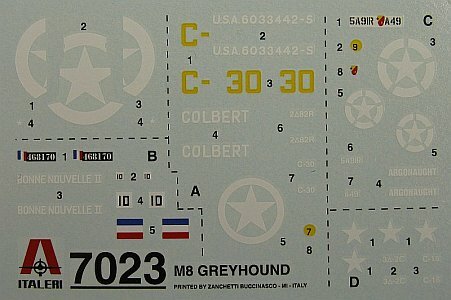 Not finding anything suitable I contacted Starfighter Decals to print me a custom set. So in the end I can say that the Italeri M-8 is a nice kit straight from the box only let down by the lack of a turret interior and less than stellar wheels. With a little work it can be made into a standout. Review samples purchased by the author.